Celebrate Father's Day in Shakespeare's England! Shakespeare's England is offering Dad's & Granddad's a whole host of treats including free admission to attractions and special offers including free beer with which to celebrate on Sunday 18 June. Shakespeare's England is the place to spoil Dad's and Granddads this Father's Day! (Please note all offers are valid on 18 June unless otherwise stated). Send Dad 'back to school' with a special storytelling and poetry workshop from 2 - 3pm at The Shakespeare Centre. 'Poems for Dads' is part of the 64th Stratford-upon-Avon Poetry Festival organised by the Shakespeare Birthplace Trust. Recommended for children aged 5 and above. Tickets: £10 adults, £5 children or £25 for a family ticket (2 adults & 4 children). Treat Dad to a trip to Stratford Butterfly Farm, the UK's largest tropical butterfly paradise. With a paying child, Dads can enjoy free entry (not to be used in conjunction with any other offer). Dads and their families can also Meet the Minibeasts at 12pm in the Discovery Zone and get up close to amazing creatures such as giant African millipedes, Madagascan hissing cockroaches and strawberry hermit crabs! For Dad's that love vintage motorcycles then a visit to the British Motor Museum on Father's Day is a must. The Vintage Motor Cycle Club Banbury Run will celebrate its 69th year when 500 Veteran and Vintage motorcycles will ride out from the Museum. Spectator tickets cost £8 in advance or £10 on the day for adults/concessions; children cost £8 advance or £9 on the day. All tickets include entry to the Museum and Collections Centre. What if William Shakespeare had been a time travelling wizard? Would it be more magical, with everything more vibrant and colourful? Father's Day is magical for Dads and Stratford's most magical attraction has a simply "wizard offer". All Dads and Granddads will get free entry to the Enchanted Manor attraction when accompanied by a paying child of any age. Just say "I'm a wizard and this is my apprentice!" to claim! Get down to The MAD Museum and interact with crazy machines, build your own marble runs and get inspired to create back at home. MAD is offering 10% off a family ticket (£19.80) or 20% off an individual ticket for Dad (£7.02). Just say "Dad wants to be a designer" at the reception desk to redeem the discount! will also be a full programme of free talks and demonstrations with opportunities to taste, learn, meet and talk with top chefs and producers. Take Dad on an award winning brewery tour at Purity Brewing on 17 June at 10.30am or 2pm with a buy one; get one free offer for any paying guest who brings their dad with them. Contact or call to make a booking (subject to availability). Dads go free at Shakespeare's Schoolroom & Guildhall when they visit with their family! Ditch the socks and dodgy tie and give Dads the chance to explore a unique and previously untold part of Shakespeare's life at one of England's most exciting cultural destinations. Quote 'Dads Go Free' at the reception desk on arrival. Leamington Spa Art Gallery & Museum is running a sock making session from 1 - 3pm when children can make their father's day gift stand out from the crowd by making personalised socks! Activity is free, just drop in and join in. Compton Verney is offering free entry for Dads and Granddads when they visit with their families plus a half price Father's Day Roast in the Compton Kitchen. It's a great opportunity to enjoy the great outdoors and see the new acclaimed spring exhibition 'Creating the Countryside' (the exhibition ends on 18 June). Join in a very sociable quiz trail walk round Stratford-upon-Avon looking for answers to a mix of questions. Meet up with your Trivia Trail host at the Mercure Shakespeare hotel for the 11am or 1.30pm trail before setting off returning 90 minutes later for scoring and prizes for winning team members. Adults: £10.00 each; Child aged 9-16: £3.00; Child 0 - 8: free. 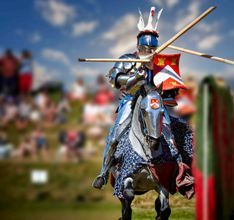 See the Grand Medieval Joust at Kenilworth Castle on 17 & 18 June from 11am - 5pm. Feel the heat of the contest as magnificent knights on horseback clash at the greatest event of medieval England. Cheer on your favourite in this thundering battle of bravery and honour. Soak up the medieval way of life in the colourful encampments and be entertained by the naughty court jester while your budding young knights test their strength in the field. Belgrade Theatre will host a series of live music tributes, the perfect Father's Day gift for music loving Dads! Frank Cognoscenti stars in That's Life - The Sinatra Story on 28 June. The Johnny Cash Roadshow visits on 20 June when Clive John adopts the persona of Cash, accompanied by a live band. Iconic will be showcasing simply the best movie tracks on 27 June. Get 20% off the total cost of your tickets when you book for 2 of the shows. Take Dad to see 'Viola and double bass take centre stage' on 20 June at Stratford ArtsHouse with Orchestra of the Swan. Hear Glyndebourne Opera's composer-in-residence Julian Philips' new work commissioned to mark OOTS' 21st Anniversary. Tickets cost from £9.50 to £27.50. Visit the 5th floor of Resorts World Birmingham for Japanese whiskey tasting at The Sky Bar at 5pm, 6pm, 7pm and 8pm. Cost is £25 per person. With 18 food outlets there is plenty of choice to treat Dad to a meal. Robata Bar & Grill will treat Dad to a free pint of Ashai beer with his main course. Dads eat free at The World Bar where there's live music from 6pm and High Line are offering a free starter for Dads with their main course. Show Dad how much you care with a special 3-course menu at Ardencote. After lunch feed the ducks or take a stroll around the gardens. 3-courses costs £24.95 per adult, £12.50 per child (aged between 5-12) and under 5's eat for FREE! Treat Dad to a family lunch with live Jazz, including a gift at The Arden in Stratford-upon-Avon. 2-courses cost £27.50 per person. Head over to The Kings Hotel in Chipping Campden for a traditional lunch with a treat for hardworking dads! Cost is £23.50 per person. For that extra treat visit Mallory Court Country House Hotel & Spa for a 3-course meal with coffee. Cost is £45 in the main house or £27.50 per person in the Brasserie. Dads, who have a bite to eat at The Townhouse in Stratford-upon-Avon with at least one other family member, get a free pint of Brakspear Bitter or Amstel lager. Maximum of 2 free pints per party, so bring Granddad too! Dads can also enter a competition to win one of two pairs of UEFA tickets (Game will be one of the group stages). Treat Dad to lunch at The Bell at Alderminster. Dine in the restaurant or take drinks in the landscaped garden. Listen to live music from the amazing Elliott Rooney from 2.30pm - 5pm and IF the weather is good there will be a BBQ. Enjoy a traditional Sunday roast at Marco's New York Italian in Chapel Street. Prices start from £11.95 and all fathers will receive a free Birra Moretti or a glass of house wine with their roast lunch. Treat Dad to a traditional Sunday roast at The Howard Arms in Ilmington with a free pint on the house! For more information in Shakespeare's England please visit http://shakespeares-england.co.uk or call 01789 260 677.